A new TV series celebrates the 50th anniversary of Britain's first national trail, the Pennine Way, that is on 24 April 2015. The Pennine Way is broadcast weekly in four episodes from Friday 10 April at 7.30pm on BBC One Yorkshire & Lincolnshire, North East & Cumbria, and the North West. It is also available nationwide on iPlayer for 30 days thereafter to watch or download. In it adventurer Paul Rose takes an evocative journey along the "backbone of England". In the first episode he meets Sylvia Franks, friend of campaigning hill walker Tom Stephenson, the architect of the route, and visits Kinder Scout, a place of revolution as people demanded access to the countryside. 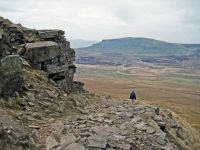 The protests were a key moment in the battle for the "right to roam" and against this background the idea began to take shape of a long-distance trail in the North of England that became the Pennine Way National Trail. National Trails are inviting everyone to join in a celebratory mass-walking event called Walk the Pennine Way in a Day. Other events and media coverage for the Trail anniversary are listed here.